Пропонована робота виконана в межах теорії діалогізму, що виступає підґрунтям процесу текстотворення та зумовлює вибір мовних засобів. Застосовано теорію авантексту, який представляє собою інваріантну модель побудови фольклорного тексту. Вивчено заголовок як композиційний елемент британської фольклорної п’єси з точки зору його діалогічних відношень з безпосередньо текстом п’єси та британською традицією загалом. У межах дослідження проведено аналіз форм і функцій, які є характерними для заголовку британської фольклорної п’єси. Встановлено такі функції: номінативна, інформативна, прогностична, а також орнаментально-організаційна, яка є специфічною для жанру британської фольклорної п’єси. Keywords: avant-text, British folk play, dialogic relations, forms, functions, title. English Language Department, School of Foreign Languages, V.N. Karazin Kharkiv National University, Kharkiv, Ukraine. Background: The research is based on the crucial principles of M. Bakhtin’s dialogic theory. Being combined with major ideas of the theory of speech genres and that of folklore, it builds the frame for the determination of the role of dialogic relations in the formation and implementation of British folk play genre model. Purpose: The purpose of the study is to reveal the peculiarities of the title as a compositional element of British folk play in terms of its dialogic relations with British folklore. Results: British folklore play title has an artificial nature since folklore collectors create them for the purpose of convenience in cataloguing. It explains their specific forms that usually reflect 1. the name of the place and the date of the recording; 2. the form of the performance; 3. the festival it belongs to; 4. the main character’s name; 5. the belonging to a certain cycle; and 6. the reminiscence of the plot. The functions that British folk play title performs result from the fact that the title acts as a leading element for the performer by specifying topics, plots, motives, structure and composition. Their role in the avant-text presupposes nomination, information, prediction as well as framing and structuring the variant even before its performance. Discussion: Textual and functional analyses and the method of stylistic differentiation permitted to conclude that British folk play title possesses a nominative-chronological character and displays dialogic relations between the recipients and their social and cultural context. Thus, the problem of determining characteristic featured of folklore text formation and perception requires a careful study of the personality of folklore discourse participants. Iryna Kholmohortseva is PhD in Philology and a senior lecturer at English Language Department, School of Foreign Languages, V.N. Karazin Kharkiv National University. Her areas of research include text linguistics, intertextuality theory, functional communicative text stylistics, assessment of student’s language skills. Ключові слова: авантекст, британська фольклорна п’єса, діалогічні відношення, заголовок, форми, функції. Introduction. Dialogic nature of culture appears and acts only in the presence of Homo Cogitans – a person who perceives, and Homo Creans – a person who creates. That is why contemporary linguistics focuses its attention on dialogic interaction which unites relations between the mind and spiritual, cultural and social background of a human; as well as implements a body of elements combining certain speech elements and provides for social adjustment of an individual in the community. Thus, the subject of our research is dialogic relations which, in our opinion, are characterized both in a broad sense as having a gnoseological meaning (the formation of a personality in a certain national community) and in a narrow sense as a technique of searching and correlating existing meanings for the sake of creating a new one. Culture as a dialogue is clearly explicated in different folklore genres. One of them is the object of our research – British folk play (BFP) that naturally reflects the history and the present days of Great Britain and clearly explicates the phenomenon under study. The purpose of the present paper is to study BFP title in terms of its dialogic relations with BFP text itself and British culture in general. To achieve this we suggest following such objectives as to elicit the form of BFP title, to highlight its functions, to analyze BFP titles intertextually and find out their relations with British folk tradition. Background. The conceptual background of this study originates with philological elaboration of “dialogue” theory by M.M. Bakhtin (Bakhtin) and his followers: the theory of semiotic universum of culture (Yu.M. Lotman), intertextuality theory (Julia Kristeva) and a dialogic model of discourse (O.O. Selivanova). The researches in the determination of folklore texts and discourse (V.P. Anikin, S.Yu. Nekludov, V.O. Samokhina) contribute to a fundamental analysis of BFP. Classical works in literary criticism and ethnography (P.T Millington, T. Pettitt, I.K. Chambers) form the methodological basics to BFP survey. The review of these researches links up with the analysis of dialogical relations of BFP followed by the identification of dialogism role in the formation of genre model. Materials and methods. The study sample constitutes 232 BFP texts, a careful analysis of which allowed to define the object of the research as an authentic dramatic piece of British folklore. The genre of BFP is characterized by a verse form, a dialogical structure, a stereotyped composition comprising the title, an introductory block, a complicative block “the Battle”, a complicative block “the Cure” and a closing block, as well as a constant set of characters and a complex syntax. This genre has a hybrid nature resulting from the combination of dramatic and lyric modes as well as tragic and comic elements (Kholmohortseva 4). The concept of the present work centers itself on a multistage analysis of dialogic relations of BFP genre that comprises gnoseological, communicative, textual, linguistic and cultural and historical aspects (Selivanova 405-412). While the former two embody a communicative act of transmitting and constructing knowledge by means of the contraposition of the speaker to different realia, the other aspects reflect the peculiarities of the text formation. The textual aspect of dialogic relations implements an abstract model of the text construction available in the mind of the speaker. The linguistic aspect indicates that all stylistic means of any genre pre-exist in the present body of linguistic units accumulated in a semiotic universum of any nation. Any common knowledge of the nation assumes that there is common cultural and historical information fixed in the semiosphere which can be revealed by studying precedent phenomena used in the text. The notion of avant-text is an integral part of the research. Avant-text can be defined as an invariant genre model of a folklore text and is described as belonging to the traditional system of ideological concepts and having no final variant of the text (Kholmohortseva 5). Developing the theory of avant-text S.Yu. Nekliudov points out that the absence of a draft variant of a folklore text, which is a common practice in fiction, makes all variants of any piece of folklore unique and equal. However, they are united by the plot framework, topical blocks, typical stylistic means, etc (Nekliudov). Obviously, they create a skeleton on the basis of which the speaker forms their own variants of one and the same folklore piece. This model is connected with structural and linguistic tools that are iconic for other texts of a folklore tradition. Revealing peculiarities of BFP title and their dialogic relations as to the text and the recipient involves several steps of the research. The first step includes textual analysis by means of which we can detect structural and compositional elements. The second step is based on the use of the method of stylistic differentiation in order to systemize the forms of BFP title. The third step aims at establishing functions that BFP title performs in a folklore discourse. Results. The title being the text element and a separate informative unit at the meantime is multi-functional and multi-facet part of the text composition and thus of the avant-text. Every title can be examined in its different relations with the text and extra-textual parameters. Specific features of BFP title imply the presence and the absence of relation with the play text itself. The general information that BFP title holds reveals when and where this particular text was recorded. On the one hand, BFP title is rather artificial than authentic as it was created by the collectors of folklore items and is currently used for the convenience in the cataloging of plays. Thus, there is no obvious connection between the BFP text and its title. On the other hand, the play’s title can indicate the form of a folklore performance – Mumming, Sword Dance. In this case it acts as an assistant for the recipient to decide on the type and the genre of the folklore text that BFP belongs to. It is possible only under condition that a recipient’s semiosphere possesses information about the tradition mentioned. At last, the title can include a proper name indicating the main character of BFP. We describe this type of relation as relative since it does not reveal the topic of the play. The title of any literary work reflects the content, the plot, the motive of the text, whereas BFP title is a toponym meaning the place where the variant of BFP was recorded and the date as well. The following peculiarities of BFP titles prove that there is hardly a pure group and different forms of the title can overlap. 1. The name of the place where the play was first recorded and the date (89 % of the whole survey sample), for example, “Chester Play – before 1788” (“Chester Play” 23). This title is expressed with a proper (geographical) name and a numeral symbolizing the year. The usage of adjectives is optional. 2. In many cases BFP title points out the form of the performance (57,1 %). Its forms are usually represented by Mumming, e.g. «Northamotonshire Tander Mumming Fragments – 1851» (Strangway). This title introduces to the recipient the form of the performance – Mumming – by indicating the personal appearance of the mummers and their traditional activity – guising (Pettitt). We can also notice the involvement of a traditional Scottish dance with swords, e. g. “Words of the Ripon Sword Dance – 1920” (Kennedy 26). The name “Sword Dance” conveys a sacral meaning of the play, i.e. the representation of such topics as the human and animal sacrifices for fertility, the survival and the defense of native lands along with the protection from evil forces (Alford 36). Besides, the recipient realizes that the following performance will surely contain the elements of Scottish Sword Dance. 3. The title can reflect a certain tradition, namely, authentic British festivity (54,3 %), for example South Notts Plough Bullock Day Play (“South Notts” 83), which provides information that the BFP text belongs to a traditional Christian holiday “Plough Day”; the latter being an essential part of a cultural life of an agricultural part of eastern England. Besides, the title presents a typical for a festival Britain nomination of money collector (Plough Bullock, Plough Stots, Plough Jacks), expressed with a word-building model Nс+Nn, where Nс – constant component explicated with a proper name meaning the holiday and Nn – a noun that combining with the former creates an idiomatic construction with the sense of “extortioner”. 4. Some BFP titles contain data about the main character’s name (4,3 %), e. g. “Lutterworth St. George Play – 1865” (Kelly 52) or “St. George and the Slasher – 1817” (Edwards). The latter offers the recipient to correlate between the anthroponyms indicating the opponents in the complicative block “the Battle” – St. George and the Slasher. Their use is intertextual as to the play, namely, paratextual. Numerals in the BFP title (the year of recording) are not related to the content of the play. 5. The titles attributing BFP texts to a particular collection standout for a separate group. For example, the most famous BFP edition is the so-called “Alexander Chapbook” (3,5 %). One of its most popular plays is “Alexander and the King of Egypt – 1883 – 1901” (“Alexander and the King”), where the proper name Alexander is paratextually related to the book of the collected plays itself. 6. The description of the plot is not usually typical to BFP title, nevertheless, a small (1,3 %) percentage remains, e. g. “Cure at Bristol Fair – 1770” (“Cure at Bristol Fair”). This title concerns the plotline which is a distinctive feature for the whole cycle in general and is essentially a metatextual reference to the motive of resurrection. Considering the functions of BFP title, we naturally compare them with literary works. As O.Yu. Bohdanova claims, the authors of fiction tend to name their work only after it is finished since the whole sense of the title of a literature piece is being formed when it is being written (Bohdanova 105). The formation of the folklore text occurs vice versa. The title of a folklore text appears after its first performance and after it becomes popular within the community. Then it transforms into a leading element for the performer and specifies topics, plots, motives, structure and composition, i.e. it acts as a preserver and transmitter of the avant-text. Bearing in mind this peculiarity, we singled out general and specific functions of BFP title. General functions of BFP title partly coincide with that of literary works. 1. Nominative function, as it has been mentioned above, deals with the isolation of one variant of BFP text from the rest. Despite the fact that they can possess the same structure, motives and plot, BFP variants are individual pieces of folklore and convey traces of the presenter’s cultural and social context. Thus, BFP title is dialogically connected with the performer of this very variant. 2. Informative function connects BFP with the recipient’s background knowledge about British tradition. For example, the title “The Four Champions of Great Britain” (“The Four Champions”) is supposed to bring to light if the listener knows that “the Four Champions of Great Britain” stand for the patrons St. George of England, St. Patrick of Ireland, St. Andrew of Scotland and St. David of Wales. BFP characters with these names act metonymically and represent nations. 3. Predictive function works in the aspect of a dialogue between BFP title and BFP structure or composition. For instance, BFP title “The Greatham Sword Dance” (Peacock 29) indicates that the play performance implies the presence of another, non-verbal, code. Textual component of the play is expanded with a kinesic element. Such combination expresses intermediality which is a dialogical interaction of different media in the same plane. The title of British folk plays also performs a specific function. c. by determining BFP text stylistics. While a usual indication of place and date of BFP recording means ordinary performances at holiday fairs with their vivid interaction with the audience using common stylistic means, the titles that include the proper name “Alexander”, i.e. “Alexander and the King of Egypt”, show that the variant belongs to the collection of plays which were linguistically modified and are now characterized by a more complex structure (longer verses), the usage of sophisticated vocabulary, lots of inversions and by the grand style. Discussion. Having analyzed the survey sample, we can state that BFP title is described in terms of nominative-chronological character, though it does not influence the communicative act of the play performance being just the sign of the text/ script. Thus, the “dialogue” between the title and the rest compositional elements is absent. However, the title executes dialogic interaction with the recipient by revealing their background knowledge. As to BFP text itself the title acts as an independent element that is not substantially connected with the text. That is why we can claim that their dialogical relations are described as metatextual rather than paratextual (as it is between the text and the title of any literary work). The exceptions are those titles that include references to BFP characters. Besides, BFP title comments on social and historical features of the text, i. e. the date and the place of a variant recording. Functions performed by BFP titles represent the “dialogue” between the tradition and the background knowledge of the recipient rather than between the title and the text itself. Accomplishing general functions of nomination, information and prediction the title acts as a preserver and a transmitter of knowledge about British tradition; whereas the function of framing and structuring concentrates on the way the recipient extracts this knowledge from the text. Alford, V. Sword dance and drama. – London : Merlin Press, 1962. Print. Anikin, V. P. Teoriya folklore. Kurs Lektsiy (Folklore Theory. Course of Lectures). Moscow: Moscow State University Press, 1996. Print. Bakhtin, M. M. Problema Peotiki Dostoievskogo (The Problem Dostoievskiy’s Poetics). Moscow: Sovetskaya Rossiya Publ., 1979. Print. Bohdanova, O. Yu. 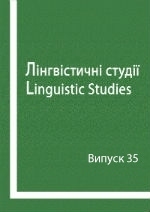 “Lingvostilisticheskiy Analiz Zagolovka Kak Elementa Anglo-Yazychnogo Teksta (Linguistic and Stylistic Analysis of a Title as an English Text Element).” Yaroslavskiy Pedagog. Vestnik (Yaroslavl’ Pedagogical Bulletin) 1 (46), (2006): 104‑110. Print. Kholmohortseva, Iryna “Dialogichni Vidnoshennia Zhanru Brytans’koii Fol’klornoii P’yesy (Dialogical Relations of the Genre of British Folklore Play).” Diss. V.N. Karazin Kharkiv National University, 2016. Abstract. Print. Kristeva, Julia. “Bakhtin, Slovo, Dialog i Roman (Bakhtin, Word, Dialogue and Novel).” Frantsuzskaya Semiotika: Ot Strukturalizma k Poststrukturalizmu (French Semiotics: From Structuralism to Poststructuralism). Moskow: Progress Publ., 2000, 427‑457. Print. Lotman, Yuri. “Vnutri mysliashikh mirov (Universe of the Mind)” Semiopfera (On the Semiosphere). Saint-Petersburg: Iskusstvo-SPB Publ., 2010. 71–390. Print. Millington, Peter Thomas. The origins and development of English folk plays. Diss. U of Sheffield, 2002. Print. Nekludov, S. Yu. “Avantekst v Folklornoy Traditsii (Avant-Text in Folklore Tradition).” Folklor i Postfolklor: Sruktura, Tipologiya, Semiotica (Folklore and Postfolklore: Structure, Typology, Semiotics). Web. 22 March 2012. Pettitt, Tom. “When the Golden Bough Breaks: Folk Drama and the Theatre Historian.” Nordic Journal of English Studies 4 (2) (2005). Web. 17 June 2013. Samokhina, Victoria. Zhart u Suchasnomu Komunikatyvnomu Prostori Velykoyi Brytaniyi ta SShA (Joke in the Present-Day Communicative Space of Great Britain and the USA) (2 nd ed., rev.). Kharkiv: KhNU, 2012. Print. Selivanova, Olena. Svit Svidomosti v Movi. Mir Soznaniya v Yazyke (World of Consciousness in Language). Cherkasy: Yu.A. Chabanenko Publ., 2012. Print. Srebrianskaya, N. A. and Martynova, E. A. Spetsifika Funktsiy Zaglaviy Khudozhestvennykh Poizvedeniy v Zhanre Antiutopii (Specific Functions of Fiction Titles in the Genre of Anti-Utopia). Vestnik VGU. Seriya: Lingvistika i Mezhkul’turnaya Kommunikatsiya (VSU Bulletin. Series: Linguistics and Intercultural Communication) 1 (2015): 40‑47. Print. Alexander and the King of Egypt. Newcastle : J. White, Web. 21 March 2018. Atkinson, Augustus J. St. George and the Turkish Knight: A Ryghte Auncient and Tragicale Christmas Drama, as represented at St. John's School, Longsight. Manchester: John Heywood, 1885. Web. 22 March 2018. Chester Play – before 1788. An Eighteen Century Play from Chester. Roomer 2 (4/5) (1982): 23‑29. Print. Cure at Bristol Fair.” The Eccentricities of John Edwin. Comedian 1. London : J. Strahan, 1791, 253‑264. Print. Edwards, J. St. George and Slasher. Oxford, Web. 19 March 2015. Kelly, W. Notices Illustrative of the Drama, and other Popular Amusements. London : John Russell Smith, 1865, 51‑56. Print. Kennedy, D. “Observations on the Sword-Dance and Mummers' Play.” Journal of the English Folk Dance Society 3 (1930): 26‑38. Print. Lawrence, M. J. P. Guisers' Play. Scots Magazine 66 (3) (1956): 197‑201. Print. Peacock, N. The Greatham Sword Dance. Journal of the English Folk Dance and Song Society VII (1956): 29‑39. Print. South Notts Plough Bullock Day Play – 1873. Notes about Notts. Nottingham : T.Forman & Sons, 1874. 83‑85. Print. Strangway F. H. E. The Silverton Mummers’ Rhymes. Web. 19 March 2015. The Four Champions of Great Britain: Showing how St. George of England, St. Patrick of Ireland, St. Andrew of Scotland and St. David of Wales conquered the Representatives of all Nations. Leeds: C.H. Johnson. Web. 22 March 2018. Надійшла до редакції 24 березня 2018 року.